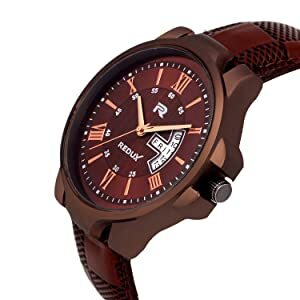 Redux brings to you this watch which is designed for the men with a knack for stylish timepieces. The watch is brown in colour and complements your overall persona when you adorn it. It has a round dial with a leather strap. The hour and minute hands are spread across the dial which has symbols instead of numerals. The watch band is brown in colour and is made from leather. It has a buckle clasp type which overall complements the overall look of the watch. The buckle clasp helps the watch to fit comfortably on your wrist. 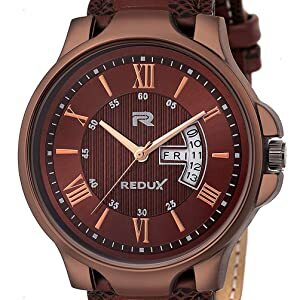 Beautiful at first sight and breathtaking when adorned, the Designer collection of watches by REDUX are all about the added dose of charisma, which blend in elegantly with the manly requirements of spreading beauty in every stride they walk with. 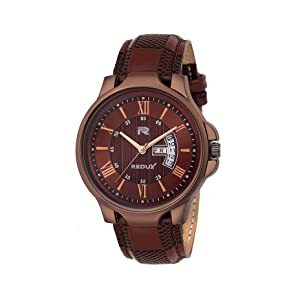 A Brown color strap brought together to form the strap of the watch along with a round face looks beautiful on your wrist. The contemporary design splurged on the Brown dial background cozies beautifully with the Cooper designer bezel. Chronograph is for show purpose only.